The plantar aponeurosis is the thick mid component of the deep fascia of the sole. The plantar aponeurosis is triangle shaped and fills the central space of the sole. The apex of the plantar aponeurosis is connected to the medial tubercle of calcaneum, proximal to the connection of the flexor digitorum brevis. The bottom of the plantar aponeurosis close to the heads of the metatarsals splits into five straps, one for every toe. At the spot of division, the five developments are connected by the transverse fascial fibres. The digital nerves and vessels pierce the spaces among the developments. Every single strap divides opposite the metatarso-phalangeal joints into a superficial and a deeper slip. The peripheral slip is connected to the dermis of the skin and mixes with the superficial transverse metatarsal ligaments. The deep slip splits into two parts, which enclose the flexor tendons, and mix with the fibrous flexor sheaths and deep transverse metatarsal ligaments. 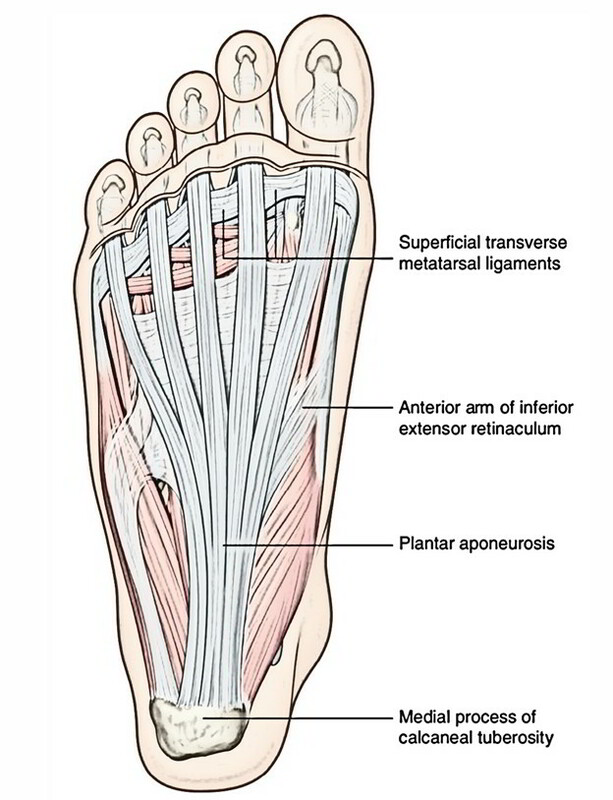 From the lateral and medial borders of the aponeurosis, the medial and lateral vertical intermuscular septa travel deeply, and separate the plantar muscles into three divisions– medial, intermediate, and lateral. The slimmer transverse septa originate from the vertical septa and separate the muscles of the sole in four parts. Morphologically the plantar aponeurosis appears as the devolved tendon of plantaris muscle, which has been split by expanding heel during evolution. While walking, the plantar aponeurosis functions mainly while “heel rise” to “toe off.” It balances the arch of the foot and enables flexion of the first metatarsal, enabling the first metatarsal to hold most of the body weight. It also gives shock absorption when ever the foot hits the ground. It strongly holds the skin of the sole. It gives rise to the muscles of first coating of the sole. It shields the plantar nerve and vessels from squeezing. It assists in maintaining the longitudinal arches of the foot by functioning as tie beam. The plantar fascia upholds the longitudinal arch of the foot in the time of fixed stance. Metatarsal splaying and degeneration in arch shape appear with splitting of the plantar fascia during simulated static stance, showing that the plantar fascia forms portion of a transverse and longitudinal tie-bar system throughout the foot. At the time of fixed stance, the medial longitudinal arch has been made like a beam, with the plantar fascia acting as a tension component, or tie-bar, connecting two compressive components. With weight holding and internal tibial rotation, extension of the arch is limited, partially, by tension in the plantar structures. Within non-weight bearing situations, dorsiflexion of the toes has been shown to enhance tension within the plantar fascia, leading to plantar flexion of the corresponding metatarsals and elevating of the medial longitudinal arch; the windlass mechanism. In weight -holding situations, however, like during static stance, plantar flexion of the metatarsals is opposed by reaction force, and elevation of the arch is obtained by a complicated motion of supination and external rotation of the foot and lower limb. Such a movement pattern is to enhance the stability of the arch and activation of the windlass mechanism is clinically believed for being important during the propulsive period of gait. The plantar aponeurosis is extended during standing position. Thus, tearing or inflammation (plantar fasciitis) often occurs in individuals who do a lot of standing or walking, viz. traffic police personnel. It results in pain and tenderness in the sole of the foot particularly underneath the heel while standing. Repeated attack of the plantar fasciitis causes calcification in the posterior attachment of the plantar aponeurosis forming a calcaneal spur.